Hungary’s radical right-wing Jobbik party commemorated the 95th anniversary of Admiral Miklós Horthy’s “March on Budapest” on Sunday. Following 133 days of “red terror” under the Hungarian Soviet Republic under Béla Kun, and the invasion of Romanian, Serbian, French and Czechoslovakian interventionist armies, Horthy’s march into Budapest on a white horse marked the beginning of his nationalist regime. Jobbik members and ultra-nationalist youth leaders still hold Horthy as a “political example” in Hungarian history. 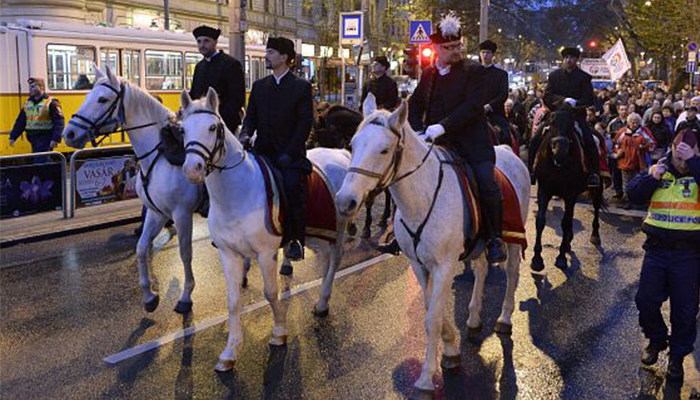 Each year at this time they evoke the admiral’s memory by marching through the streets of southern Buda in period clothing, with a rider leading the procession on a white horse. Jobbik MP Előd Novák told the crowd that even though Horthy needed to deal with a far more severe economic crisis, the Great Depression between 1929 and 1933, he did “a far superior job than his present counterparts.” Novák said the Horthy era was a “flourishing age” for Hungary, even after the hardship caused by the 1920 treaty of Trianon and the Spanish flu epidemic. Following the admiral’s route in the reverse direction, the crowd of 200 departed from Szent Gellért tér and ended its march on Kelenhegyi út, where speeches were delivered. Among those addressing the audience were Marcell Tokody, Jobbik Budapest city councillor, and Loránd Hegedüs Jr., a hardliner Calvinist preacher whose wife is a Jobbik member of parliament. Historical literature shows that Horthy’s takeover in 1919 brought almost two years of violent reprisals. Answering the Hungarian Soviet Republic’s “red terror”, Horthy and his army embarked upon a “white terror” between 1919 and 1920, claiming thousands of lives. The terror measures did not exclusively affect former Bolshevik leaders. As Horthy’s regime held the whole Hungarian Jewish community collectively responsible for the communist revolution of March 1919, anti-Semitic riots erupted throughout the country. Horthy’s unofficial terror squads, the “Ragged Regiments”, systematically kidnapped and murdered journalists exposing massacres previously committed by the squads. Anti-Jewish sentiments were continuously present in the ideology of Horthy. The Numerus Clausus law of 1920 restricted university enrollment for Jewish students. The Horthy regime was also responsible for the deportation of more than 400 thousand Hungarian Jews in 1944. Another 43,000 perished in Jewish forced-labour batallions attached to the Hungarian army. Under Horthy Hungarian armed forces committed anti-Serbian and anti-Jewish massacres in the occupied Yugoslavian city of Novi Sad during 1941.